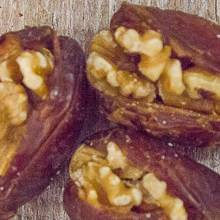 We start with jumbo Medjool dates, remove the pits, and stuff them with walnuts. The end result is pure sweet goodness! Eating Medjool dates helps promote healthy living and gives you a sustained energy burst that can't be beat. You will enjoy the amazing health benefits of this delicious dried fruit and the protein of the fancy walnuts.